NoDa residents are certainly no strangers to the development and redevelopment growth happening throughout the neighborhood of NoDa, which is officially bordered by Matheson Avenue, North Tryon Street, Sugar Creek Road, and The Plaza. In 2018, we saw seven formal rezoning requests that were filed with the city and subsequently reviewed by the NoDa Neighborhood and Business Association (NBA), a 501c3 non-profit organization. Community Meeting. A developer files a rezoning request with the City of Charlotte and is required to host a Community Meeting. Developers do not have to appear at NBA meetings, but recently, city staff has been encouraging developers to use NBA meetings for their community meetings because the participating audience is larger. Invitations to a Community Meeting are mailed to proximate property owners, but any interested party can attend. Residents and interested parties can and do meet with developers on their own to gather information and provide feedback. The NBA encourages active dialog above and beyond their monthly meeting. You can look up individual rezoning petitions on the city’s website charlottenc.gov/planning/rezoning, where the petitions are listed by the year and a number, e.g. 2018-049. Two presentations. Developers are not required to communicate with the NBA or appear at NBA meetings but have found it is an important step in working through their petition. This way, misalignment and other issues often surface and can be resolved quickly and in advance of City Council voting. The NBA’s process is to have petitioners make at least two presentations to the NBA, with the last presentation resulting in an NBA vote to support or not support the petition. Vote. Eligible NBA members vote their support for or against the petition and offer caveats with those approvals. Earning your right to vote is as simple as paying NBA dues and attending a minimum of three NBA meetings, whether you are a resident, property owner, or even a representative of a business. Members may maintain voting status by paying their yearly dues thereafter. Discussions and Letter of Support. The NBA Board works with the petitioner to resolve the Association’s questions and concerns. The NBA Board of Directors subsequently votes on whether to send a letter to the city (this generally occurs), the content of that letter, and inclusion of caveats to their position of support. These caveats are ideally written into the zoning site plan when approved by the city and become part of the zoning status. Approvals. City Council has the ultimate decision on approving a rezoning petition. The NoDa NBA’s support or non-support is simply feedback for their decision. If a rezoning petition is not approved, no new rezoning petition can be submitted for two years. Development can still occur in that two-year period, but that development must meet the current zoning guidelines. When a petition is approved for rezoning, the approval goes with the land and not the owner. If the land is sold, the subsequent owner must abide by the zoning status and zoning notes as listed on the approved site plan or file a new rezoning request. Questions about Rezoning?NoDa’s website has NBA meeting minutes with details on developer presentations, membership discussion, and the resulting votes or to find the letters of support written to the city. Contact the NBA Board by emailing board@noda.org. 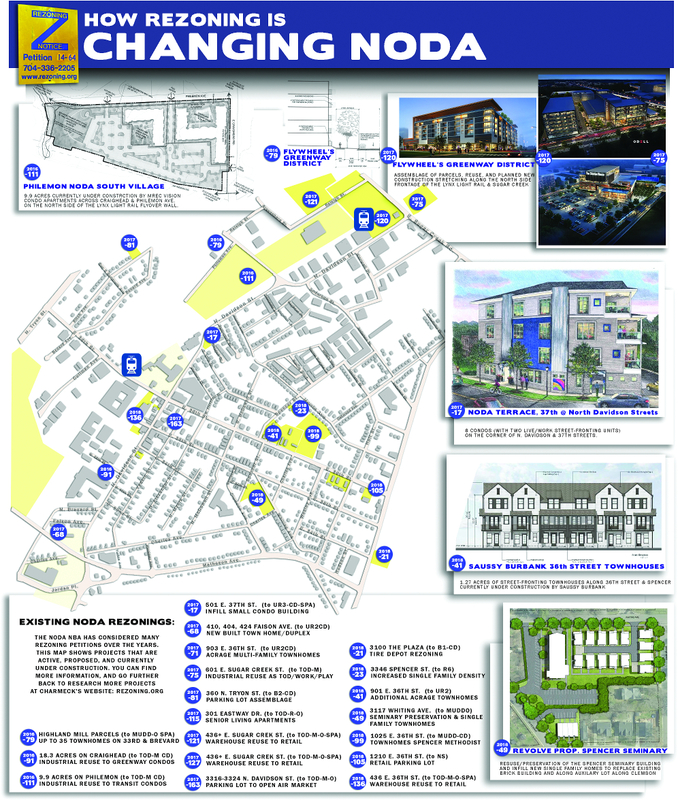 See our rezoning infographic upclose HERE.